This post originally appeared on Activity Tailor February 19, 2013: The developers at Toca Boca know how to entice an audience and grapple for our attention. The premise of the app is simple: Slice, blend, boil, fry, and/or microwave a selection of food for one of two monsters. Yet, it has turned into so much more within the context of speech therapy. 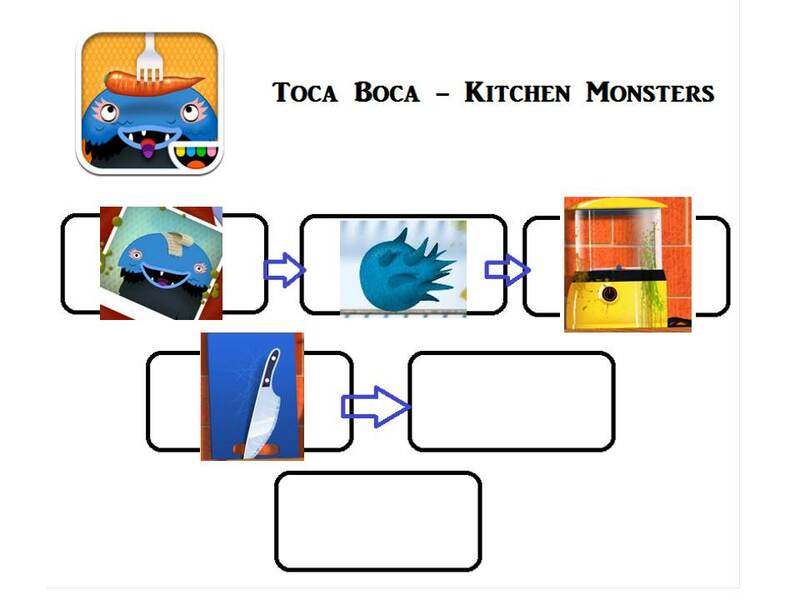 One of my favorite ways to use Toca Kitchen Monsters is to target sequencing or narrative skills. While reading a book and retelling the story has its time and place, incorporating an app which does not require clients to read allows for creativity and fun. Furthermore, a child’s ability to verbally create narratives has been linked to successful acquisition of literacy (Catts, Hogan, & Fey; Snow, Burns, & Griffin, 1998; Tabors, Snow, & Dickinson, 2001). With that being said, a pre-game activity helps foster the narrative skills for children. Before opening the app, I have the client or group decide what monster, food, and cooking method we will use, and in what order we will do complete the task using the sequencing sheet I’ve created. For instance, we decide to select the blue monster that will eat the monster food. First he will blend it up, and then cut it into 10 pieces. Last, he will gobble it up. Once finished, the sequencing sheet looks like the below example. Once we review the sequence, let the games begin! Open the app and follow the order of the sequence sheet with client. Afterwards, depending on your targeted goals and age, you can have them retell the sequence of events as a narrative using S + V + O (subject + verb + object) sentences, descriptive vocabulary (i.e. the yellow lemon, the stinky monster), and temporal words (first, next, last). Check out Activity Tailor on Twitter, Teachers-Pay-Teachers, her Custom-made Products, and subscribe to her blog for weekly posts! Thanks so much for this post…I was looking for an app that could target sequencing skills with my 5 year old. Hopefully he’ll be intrigued! this is great. Any excuse for a new toca boca game, I say.